After leaving the desert to wander the realm of men, Caelfel suddenly finds herself facing a dangerous werewolf pack. Brenin, a valiant prince, saves her life after a near fatal encounter with Tarion, the alpha werewolf. As the werewolves continue to terrorize Kanetalm, Caelfel and Prince Brenin work together to try to stop this werewolf menace. First, let me say I didn’t read the first book in this series, but I really don’t feel like that detracted from understanding what happens in this book. Yes, there’s a history between two of the characters, but enough information is given so that I wasn’t confused. This book contains much that a good fantasy story requires: elves, princes, werewolves, magic, etc. If you’re a fantasy fan, your heart rate probably increased a little after reading that sentence. The action begins almost immediately and continues at a good pace throughout the story. With Calelfel, I had a love/hate relationship. I like that she’s spirited, a bit of a rebel, and not afraid to shake things up in Kanetalm, but she occasionally places herself above others. By the end of the book, she seems to have overcome those issues. Brenin is very easy to like – more of a down to earth kind of guy without all the princely airs. Overall, the author does a good job with characterization, both with MCs and supporting and the action sequences are well-planned and exciting. Just when I thought I had the ending figured out, the twist at the end took me by surprise and is a wonderful springboard for the next book. This novel would benefit from a tad more editing and attention to formatting. The story encompasses a broad scope and with multiple subplots and so many characters, it was difficult to keep things straight at times. Tightening the plot would have made for a more cohesive book. On the flip side of that, I’m not sure how many books the author has planned for this series and, by the end, everything may fit into place. 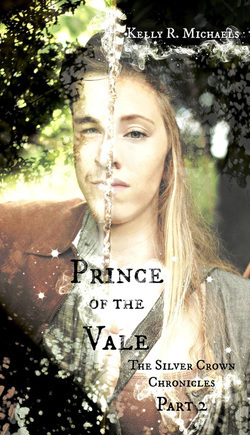 I enjoyed Prince of the Vale would recommend it to fantasy fans. If you’re not a fantasy fan, but are interested in branching out, this would be a good series to test the waters. I received a copy of this book from the author in exchange for an honest review through Rosie’s Book Review Team. Thank you Teri, I remember some of these characters from my own reading of the first book in the series. I saw on Goodreads you’d read the first one – maybe you should add this one to your list.